Sometimes barriers to sewing are real—and sometimes, they are just mental blocks and lack of inspiration. I actually recovered from carpal tunnel more than three months ago—yet I didn't start sewing again til my recent vacation in Texas when Susan pretty much ordered me to do so. BARRIER:"My daughter stays up talking to herself and her dolls til midnight almost every night—and I can't disturb her with the sound of the sewing machine in our small apartment." FIX: Move the sewing machine into my bedroom where she can't hear it. BARRIER: "I don't get to spend enough time with my husband in the evenings, and he likes to watch shows together sometimes." FIX: Pay vague attention to shows while sewing in bedroom, and stop worrying if I've lost track of characters, plots, or anything else. BARRIER: "I need to make elaborate allergy-free meals totally from scratch and stay up every evening making pickles or sourdough bread or homemade pasta." FIX: My husband likes to cook too. And we can eat more quick, simple (and still allergy-free meals) and cook more in batches. BARRIER: "Oh UGH, the worst part of sewing is all that FITTING and MUSLINING and SEAM FINISHING and HEMMING and how the heck do I have TIME for all that when I just want to WEAR something AWESOME?" FIX: forget muslins or elaborate fitted woven garments for now and just make TNT patterns, knit pieces and easy-fit skirts. So what are your barriers to sewing (or blogging) and how might YOU remove them? Cation Designs recently posted that she decided to remove one of her barriers: feeling like she needed to do an elaborate fancy dress-up photo shoot before she could blog something she had made. Mary at Young, Broke and Fabulous recently ran into a nasty money barrier when her sewing machine died—and she did a cool little fundraiser where she offered to sew items (from bags to dresses) for supporters in exchange for helping her raise the cash to buy a used floor model sewing machine. 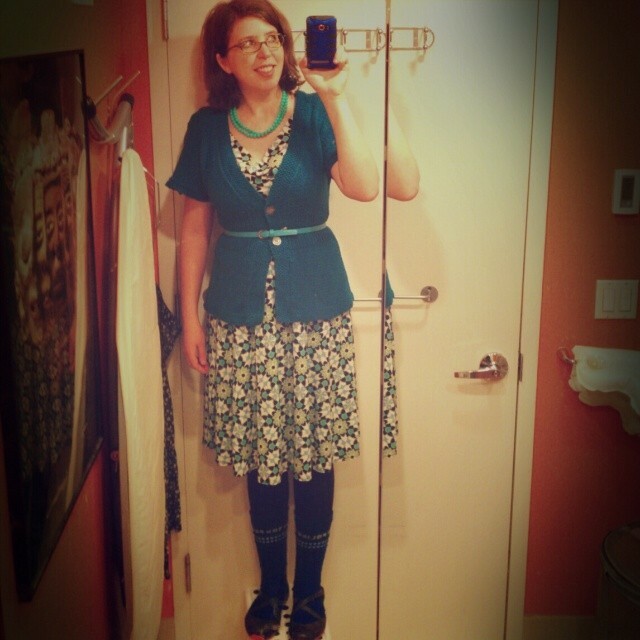 Susan at Moon Thirty has resolved to make her Me Made May a "Me Making May" where she sews something for her everyday wardrobe for at least 5 minutes a day, and she's already got a beautiful (and not-yet-hemmed-or-blogged Colette Moneta knit dress to show for it. If you don't want to sew and have other things going on—that's cool. But if you really LOVE to sew and WANT to sew but have some arbitrary rules in your head that you can't sew unless your house is spotless (#sewdontclean, people) or until you buy that new pattern or fabric you can't afford right now (time for a stash dive! ), or until you have some certain notion or supply or type of interfacing, or until you have a full day set aside, or until your toddler deigns to take a nap she probably won't EVER actually take, or until you have better lighting for your blog photos... maybe it's time to start taking it easier on yourself and just sew up a three-seam knit skirt, snap a cellphone selfie in your bathroom mirror and let all that mental baggage go. And with that—on to Me Made May! Before I start with May 4, I realize I forgot to show what I actually wore outside on May 3. I realized that I was wearing an orange zip-up sweater and an orange purse... with orange top-stitching on my shoes to boot. Orange is my happy color. (Yes, that's my daughter's hand at right). 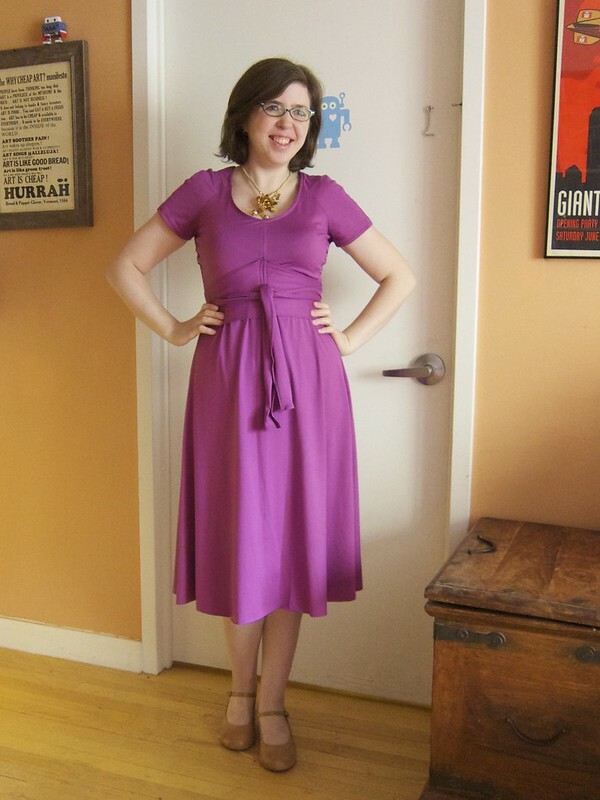 Me Made May 4: Off to Sewing Club! Socks: Monkey socks (Raveled here). 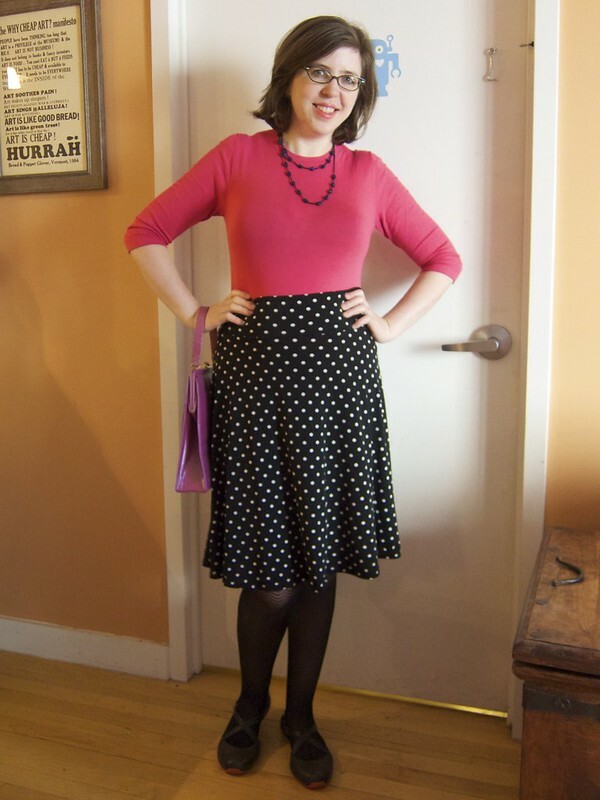 Skirt: Self-drafted no-elastic knit half circle skirt (I made a little tutorial here—it's super simple! Shoes: Ahnu Karma flats again. 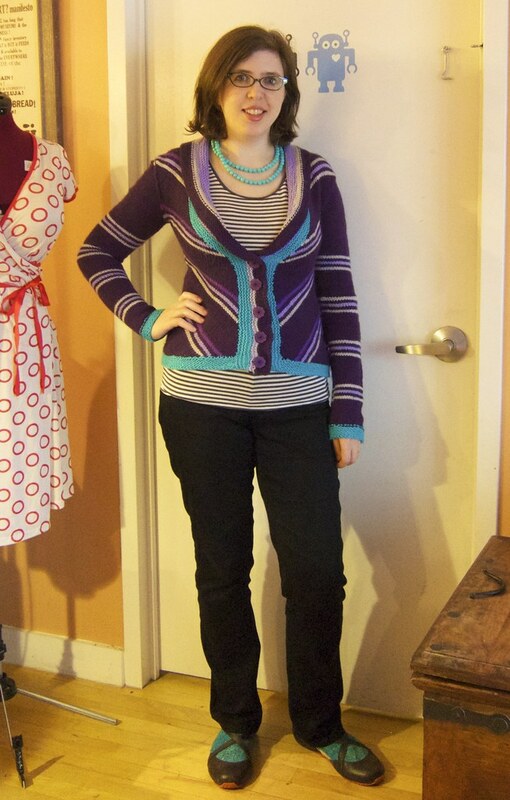 Sweater: Delancey Cardigan by Alexis Winslow, me-made (pattern is here and my Ravelry page with prettier photo shoot is here... blog post coming soon). My second unfinished object completed for Me-Made May! Socks: Me-made bright blue TARDIS socks (they are REALLY bright blue and I added elastic thread to keep them up). I barely wear this sweater because the sleeves look kinda weird even after the refashion. Hence the belt! I'm kind of tempted just to give it away so I can't feel bad about it anymore. You've already seen the shoes and necklace. Tights: Spanx reversible black/brown tights... still going strong after four years without a single run! Skirt: Hummingbird straight skirt (blogged here). 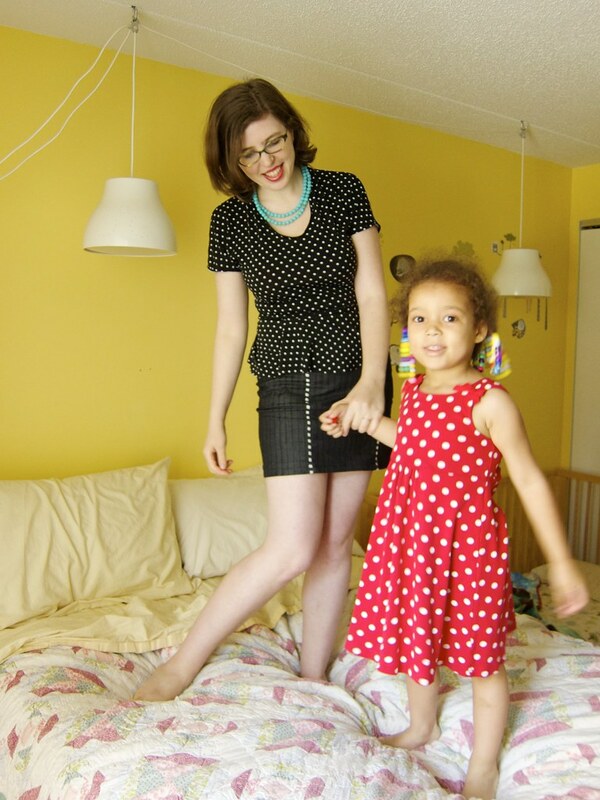 (With my polka dot loving daughter in a hand-me-down dress). 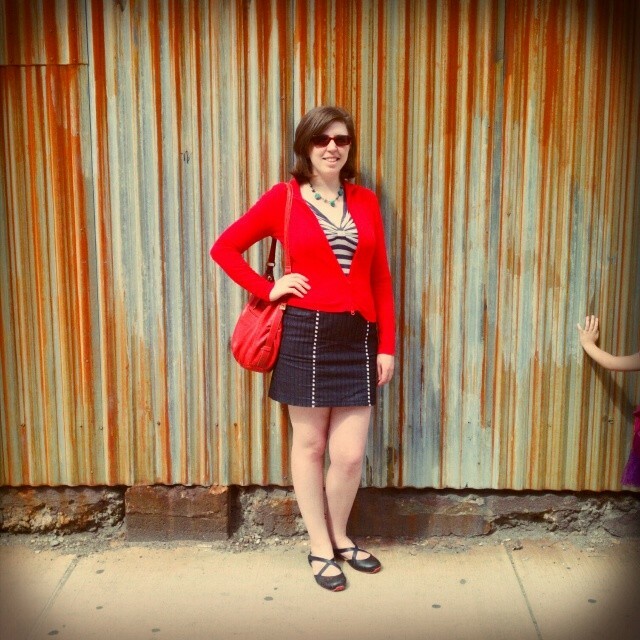 So tell me—what are your sewing/blogging barriers and how do you knock them down? Such a great post! Why do we make things so difficult for ourselves sometimes, when it can be so easy? I like your mmm outfits, especially the polkadot skirt! Yeah. And once we make it easy... then maybe we can ease back into it. Like I haven't hemmmed a few of the last items I made because I hate hemming... but now that I'm motivated again I'm going to get back to it. Your tips are great! Love how you gave examples from your own life and from other bloggers. Excellent outfits, too. I love this post. My whole creative life right now can be summarized as being crushed by barriers, some very significant, some mostly just made-up. It's so easy to just give up, and I really needed this reminder that any barrier can be isolated and broken down to find a solution (or at least an improvement). I think the basic concept goes pretty far, too. If you REALLY love doing something and it means a lot to you and there is nothing HUGE preventing it (like there was when I had carpal tunnel and could NOT do anything with my hands for several months)... you can often find a way. Somehow! For example, if you really like to bike but the weather is gross... get some good outdoor raingear and go for it. I really enjoyed seeing you break down each individual barrier to sewing! They sound so much more insignificant when addressed that way. Happy Mother's Day! 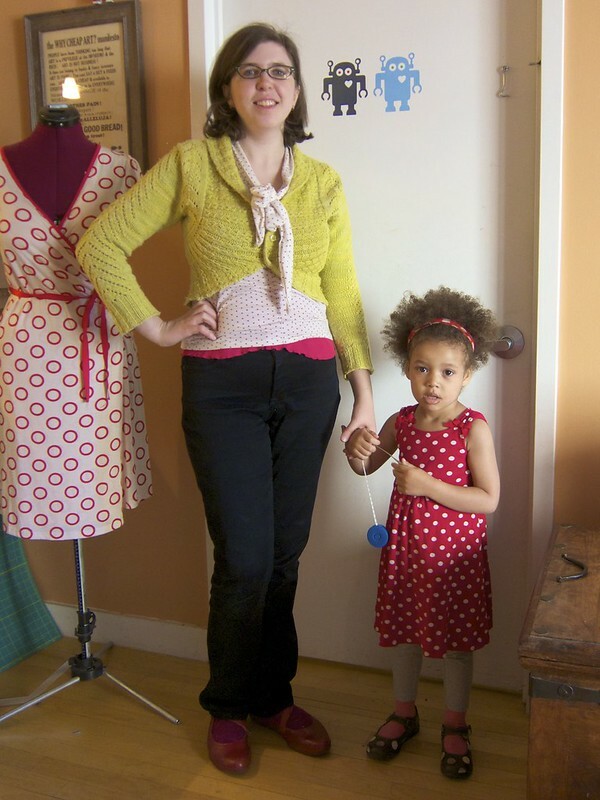 I love seeing how you accommodate and work with Z to sew such fun (and practical) outfits for yourself! Thank you! And happy cat mom's day to you and your furry one! I love this, and I completely get it!! As much as I drool over the nice sewing rooms I see on blogs and on pinterest, I know that I sew as much as I do ONLY because my sewing machine is (1) always set up; and (2) in the living space. I am able to sew in little bursts while my still very small children play around me on the weekends. It makes a really big difference in my productivity. If I had my own sewing room, it probably wouldn't happen. So for me that's major. As far as night owls, I have one of those too. At age 5, Joe sleeps less than most adults. I think he's just wired for that. As he says "I try not to close my eyes." Um ... At some point, I stopped fighting him and just accepted it as my reality. He still doesn't sleep much but I am way less exhausted from nightly battles! I do that too! She has gotten more into just sitting on the rug playing with her Legos or ponies or blocks and talking to them in some kind of high-pitched silly voice, so while she is in that zone I grab a few minutes to trace a pattern or cut fabric, etc.